Frans van Mieris was one of the most highly esteemed painters of his day. According to Houbraken he studied with Jacob Toorenvliet, with the portraitist and history painter Abraham van den Tempel, and with Gerrit Dou, who called him “the prince among his pupils”. In his early works Van Mieris followed Dou’s style although using a wider range of subjects and a painstaking and refined technique that eventually surpassed that of his master. An enormously skilled painter, he paid particular attention to the effects of light on different surfaces while his interiors are well constructed and precise. As a painter of interiors Van Mieris’ best works date from the 1650s when he produced his most accomplished compositions. From the 1670s his style modified slightly with greater emphasis on detail and a certain harshness in the illumination. In addition to interiors, Van Mieris also painted portraits and various historical subjects. The present portrait of an unknown sitter was in the collection of Maria Magdalena van Sluypwijk and was auctioned in Amsterdam on her death in 1803. The panel has a lengthy provenance: during the 19th and first quarter of the 20th century it was with various galleries and in collections in Paris, Geneva, Berlin, London and Amsterdam before it reached Julius Böhler in Munich, from whom it was acquired prior to 1930 by Hans Thyssen-Bornemisza. 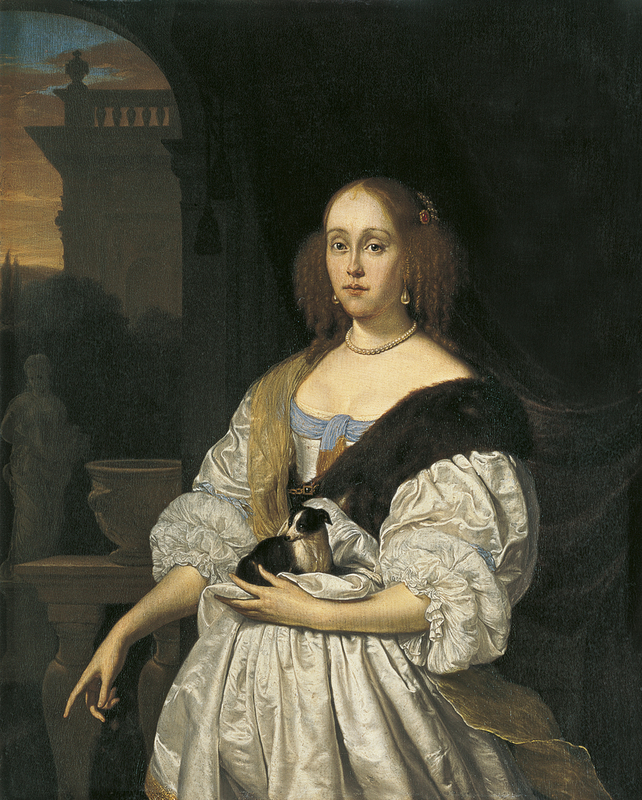 Van Mieris depicts his elegant subject standing against a background that includes a carefully painted garden on the left. The richness of the woman’s clothing, her jewels and the gesture of her pointing index finger all indicate her high social rank. In addition to the exquisite clothing and jewels, this panel also reveals the use of a highly refined technique and costly pigments. The treatment of the satin of the dress, the gauzy shawl and the fur stole is outstanding, while Van Mieris uses a particularly delicate brushstroke to convey the curls of her hair and the pearl necklace and earrings as well as the jewels in her hair. Naumann suggested that Van Mieris derived this type of portrait, which could be described as courtly and elegant, from Abraham van den Tempel, in particular a portrait by that artist dated one year prior to the present one, in which Van Dyck’s influence is evident.